Two goals from Jamie Cureton put Exeter 2-0 up but Jack Hyde's late goal saw the Grecians come under heavy pressure as Barnet tried to rescue a point. 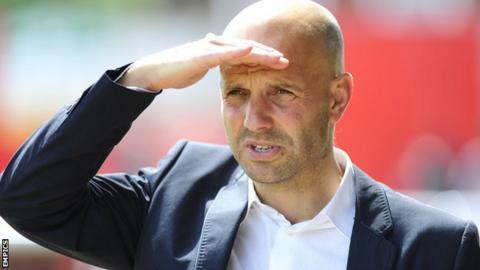 "We had to show some resolve at the end because they put us under a lot of pressure in the last five or 10 minutes," Tisdale told BBC Radio Devon. "We had to defend in a different way and we just about did it." The win was City's first for two weeks and saw them move up a place to fourth in League Two. "I'm delighted we've won, after two defeats it was important we got the result and a win was very pleasing today," Tisdale added. "We did defend very well and we had a good shape. "As the players do better as a team, by definition, the more often they will have to cope with a last five minutes of pressure. "One goal often becomes two, but that's the thing with football. "You can feel very comfortable at two and suddenly one goal lifts them and takes a bit of energy out of us. "In football it's all about trying to stop the slide and as soon as they scored the goal they had a surge of energy and we had to cope with it."